Obituary – Bay, Dollie Maxine (Dufek) « Perry High School Alumni Association, Inc.
Dollie Maxine Bay, 81, of Perry, died at 12:30 p.m. Wednesday in Perry Memorial Hospital. Services will be 2 p.m. Monday at First Christian Church of Perry with the Rev. Lynn Scott officiating. Interment will be at Grace Hill Cemetery at Perry under the direction of Brown Funeral Home of Perry. Memorial contributions may be made to First Christian Church at Perry. Mrs. Bay was born March 31, 1917 in Noble County to George and Anna (Skalenda) Dufek. She graduated from Perry High School in 1935 and married Glenn A. Bay on April 12, 1942 in Perry. She was employed as a retail clothing sales clerk at Lintz, Peters, Zorba’s and J.C. Penney. She was a landlord and assisted her husband in wheat farming. 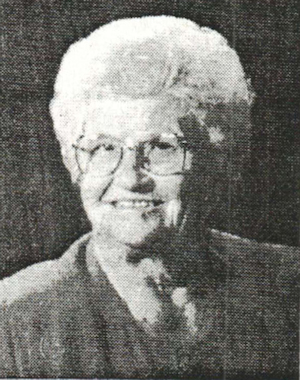 Mrs. Bay was a member of the First Christian Church of Perry and cattle ranching. Her interests included making quilts for family members and volunteering in various youth activities. Survivors include her husband, Glenn, of Perry; three daughters and sons-in-law, Glenda and Richard Bartlett of Orinda, Calif., Patty and Mike Strothman of Kingman, Kan., and Bobbe and Brooke Keddington of Bartlesville; a sister and brother-in-law, Virginia and John Wells; and six grandchildren. She was preceded in death by a brother, George Dufek Jr.